With a population of just over three hundred thousand, Iceland is Euro 2016's smallest nation (by population) so we decided to take a look deeper and see what other interesting facts the small island nation has to offer up. The 23-man squad selected by Iceland's coaching team for the 2016 Euros does not include a single footballer competing in the nation's domestic league. Oddly enough they are not the only nation in that category with the Republic of Ireland and Northern Ireland (kind of) not inviting any domestic players to the tournament. Just four years ago Iceland recorded their very worst spot in the FIFA World Rankings coming in at 131st place in April of 2012. Three years later they were at their very highest, sitting in 23rd in 2015 and now they are participating in their first ever major tournament, currently ranked 34th by FIFA. Iceland's national team has two head coaches in charge of the current squad. Local 49-year-old manager Heimir Hallgrímsson along with popular Swedish coach Lars Lagerbäck are sharing the position at the team. Whatever the necessity for two managers is, the duo seems to work well and are just a single win away from equalizing the record of being the winningest coaches in Iceland's national team history, with two wins obviously giving them the lone historic feat. Iceland's government has confirmed that more than eight percent of the nation's population will be in France for the 2016 Euros. Regardless of the country's tiny population of just over three hundred thousand, 8% is a huge figure for any country. So how would this reflect on other nations? Well, if it was the same amount of English supporters, that would translate to roughly 434,000 travellers. For Russia it would be over a million people coming into France, while (if it was a World Cup for instance) China's 8% would bring a whopping 11 million travellers into France which would equal to a sixth of France's entire population. 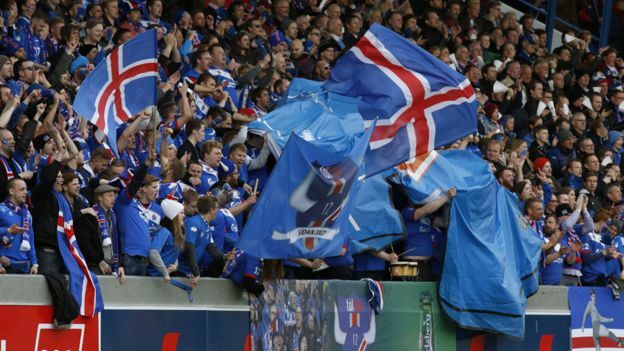 So, despite the actual figure being only at 26,985 travellers from Iceland, the 8% represents a huge chunk of the country's residents that are heading to the host nation of Euro 2016. Making international football history on the 24th of April in 1996, Iceland became the first ever national squad to have a son and father duo play in the same match. In a friendly match against Estonia, then 17 year old Eiður Guðjohnsen, who now at 37 will participate in this summer's Euros, was substituted in to replace his own father Arnór Guðjohnsen who was then just six days shy of his 35th birthday. Eiður was born when Arnór was just 18 years old, making this crazy record possible.